This range both enhances the executive desktop and fulfils utility needs. Amongst the possible range of watch stands, pen stands, box stands, calculator trays, slip index trays, slip pads, we illustrate a few items on this page. 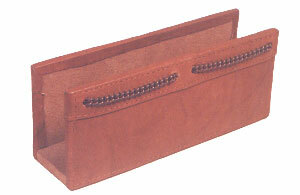 The range of organizers, folders, writing cases is shown on a separate page. 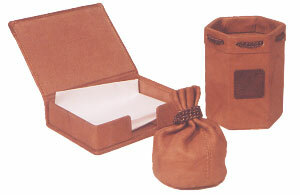 These products are available in different leathers to match your needs. 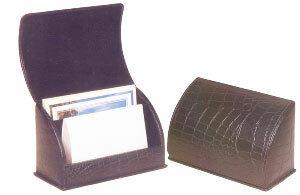 A leather letter holder with the inside lining in velvet. The size is 20 x 9 x 12.5 cm. 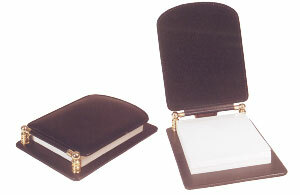 Another leather rectangular shaped memo pad. Size is 17.5 X 12.5 cm. 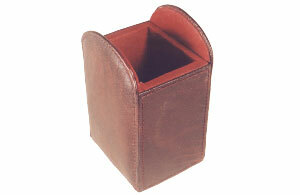 A useful accessory for the desk -- a paper holder. Size is 17.5 x 7.5 x 4.5 cm. 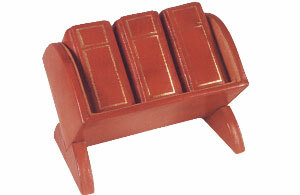 A pin stand with three small boxes to keep different types of pins. 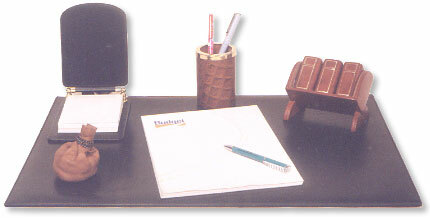 A square pen stand with velvet lining. Size is 6 cm square x 11 cm high. 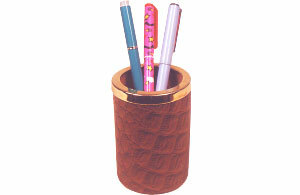 A cylindrical leather pen tumbler with a golden rim. Size is 7 cm dia x 10.5 cm high.